I think almost every mom I know dreads laundry. It seems to be never ending, take up so much of our time, and just be a drag. 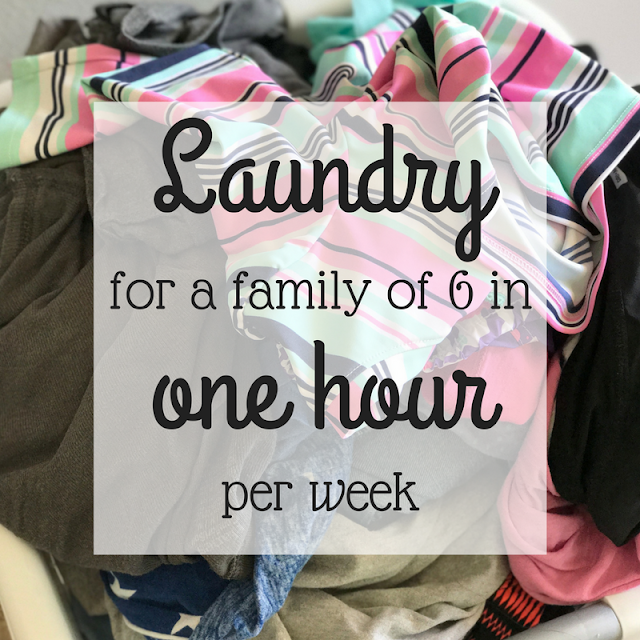 I used to feel that way a lot of the time, but I've come up with a system for laundry that works SO well for our family of 6 and only takes me just under one hour every week! Since becoming a mom of 4, I have found that when something is taking up too much of my time (chore wise), or I am completely dreading it or drowning in it, I need to reevaluate how I am doing it and why it is no longer working for me. No one way works for every home, with any chore. I was sick of falling behind with laundry and spending what felt like hours every day folding and putting it away. I used to do laundry by categorizing my laundry by person. Monday I would do mine and my husband's laundry. Tuesday I would do the girls' laundry. Wednesday I would do the boys' laundry, so on and so forth. This meant that every day I was washing about a week's worth of laundry for 2 people. For a long time I preferred doing it this way because it was less sorting. I didn't have to make 20 piles for everyone in our family and go around to each room putting things away. But after adding so many more people to our family, it just wasn't working anymore, so I reevaluated and what I've been doing for the last several months has been working out so well! It's really so simple. I wash a load of laundry every week day. I was already doing this, but now I am washing the clothes that were worn the day before by everyone in the family. I don't do laundry on the weekends so on Monday I have 3 days of laundry to wash (Friday, Saturday, Sunday) and Tuesday-Friday I am doing one day's worth. Tuesday-Friday it takes me just under 7 minutes to fold all the laundry and put it away. My girls put their own laundry away. I leave it in a pile for them on the couch and they put it away and leave their shirts/dresses on the floor for me to hang since they can't reach. 7 minutes x 4 days a week is 28 minutes. On Monday it takes me about 20 minutes to fold and put everything away. It takes me around 30 seconds to throw a load in the washer or take it out of the dryer, so just a few minutes a week for that. Add in extra loads like towels or sheets here and there throughout the week, which take even less time to fold and I am coming in right around 1 hour a week. I don't sort clothes by color (we don't wear much white aside from socks or under shirts anyway) or type (jeans, sweaters, etc.) but I wasn't doing that before either and have NEVER had a problem washing all the clothes together. 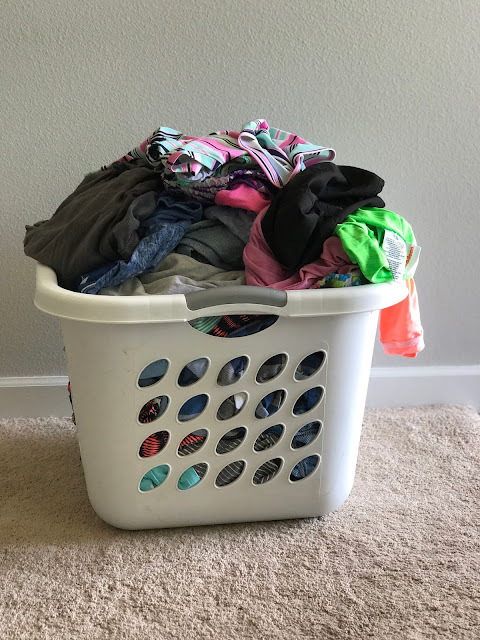 I have 1 laundry basket in the hall way and when everyone changes into their pajamas before bed, they throw their clothes from the day into the laundry basket, and in the morning after they get dressed, they throw their pajamas in and then I start the laundry right away in the morning, and fold it during the kids nap/rest time. I have no idea why it takes so much less time. It should be the same amount of clothes in a week, right? It doesn't make sense and I have no explanation, but it goes so much faster and my loads are so much smaller each day. The best part about it is that I never feel like I am behind on laundry. I have the system and routine down pat now and knowing that it only takes me a few minutes per day makes me looking forward to just getting it done! Last week I was sick on Monday, and recouping on Tuesday so I didn't get around to the weekend's laundry until Wednesday so I had to do 5 days worth of laundry for 6 people in that one day and it took me FOREVER. It really solidified for me that this system is working out SO well for me and I'm so glad I switched!